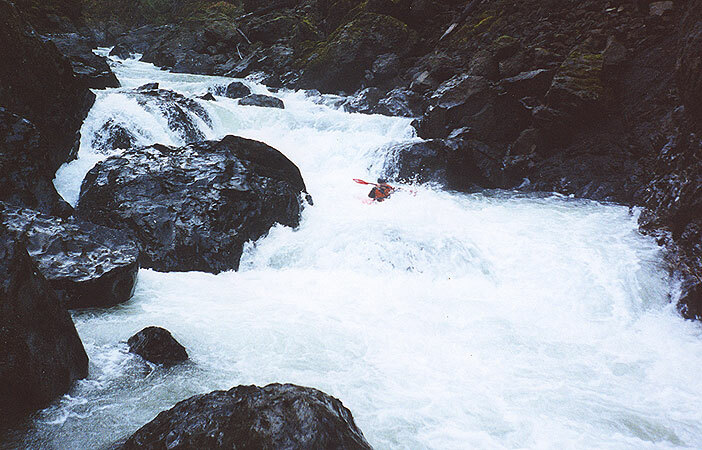 The South Fork Skokomish has some great whitewater, but only the most adventurous paddlers will enjoy this river. 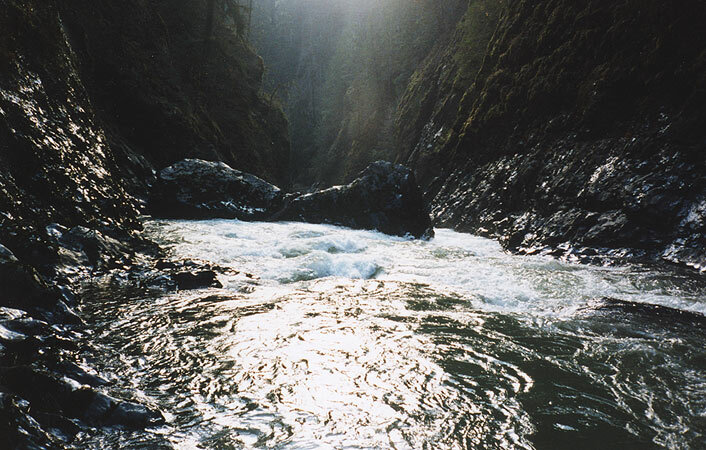 This run is located on the Southeast side of Washington's Olympic Peninsula, and the river has a remote, wild feeling akin to the Grand Canyon of the Elwha. 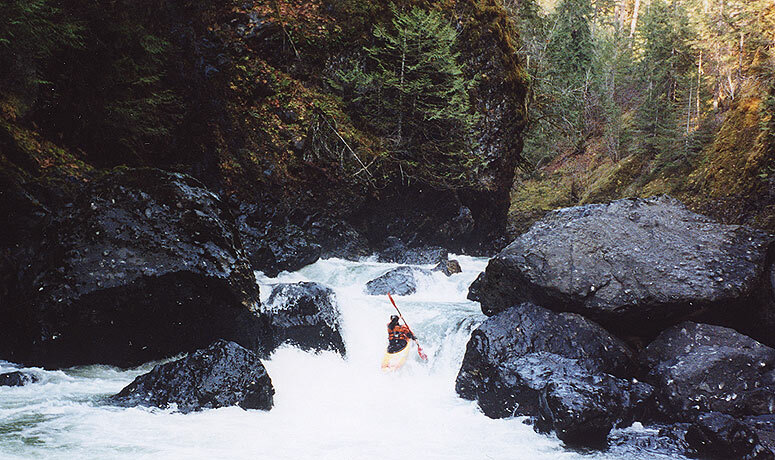 All of the whitewater on this eleven-mile section is located in the two middle gorges, so paddlers face a paddle in of about 2 miles and a paddle out of about 3 miles, all of which is on fast-moving class II water. That said, the scenery is excellent for the most part, so the mellow stuff at the beginning and the end goes by pretty quick. 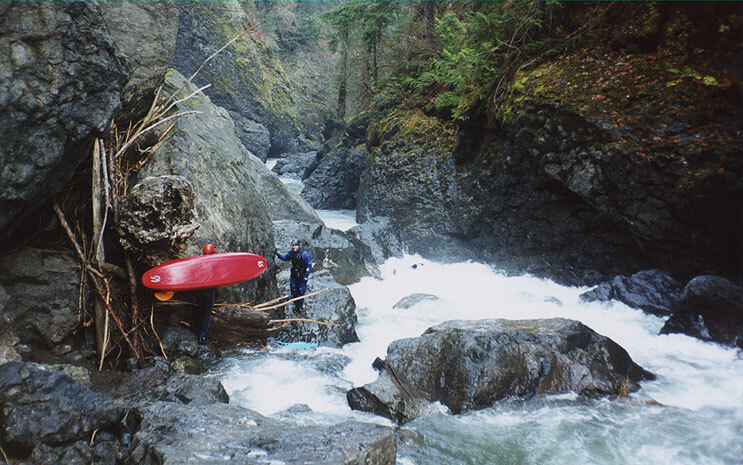 We ran the South Fork for the first time in the Winter of 2002, when everything in Oregon was bone-dry and the Olympics were the only game in town. The previous week had seen a significant rain event in Washington, and all of the Olympic rivers were dropping down from season-high levels during the previous week. On this trip Pete Giordano and I were accompanied by two accomplished German Paddlers, Jurgen Nickles and Tom Baudisch. Jurgen and Tom had flown in from Germany for a week of boating, so we scoured the Northwest for rivers and creeks with water before we came up with the SF Sko..
None of us had done the river before, so we were pretty excited. 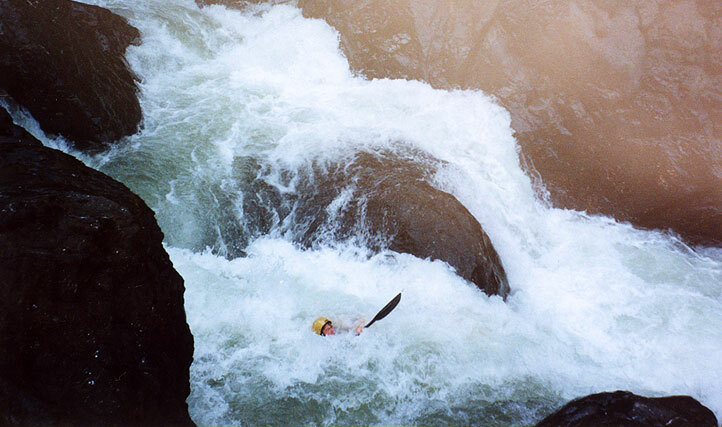 The only beta we had on the run was the Korb guidebook description (over ten years old) and the fact that one of the best paddlers I know almost drowned on this river when he got sucked into a boulder sieve. Nevertheless, we were stoked, and after a hearty breakfast of Powerbars and Coconut Cream Pie we cruised up to the put-in. The road down to the river was easy to find (the message-board in the Korb guidebook is still there) but the road was gated, forcing a half-mile downhill hike to the river. As I mentioned before, the South Fork starts off easy and kind of stays that way for a few miles. We floated lazily around a few logs, soaking up the scenery and joked about how long it had been since we had seen this much water (we had about 800 cfs on the SF Skokomish at Union internet gauge). Finally the rock walls started creeping out of the water and the river took a sharp turn to the right and dropped out of sight. We scouted on the left, and found a fun-looking class IV drop with a boof on the far right followed by a scramble past a pile of boulders in the center. No one had any problems here, but it should be noted that the middle chute on this drop appeared to have a submerged boulder in it. 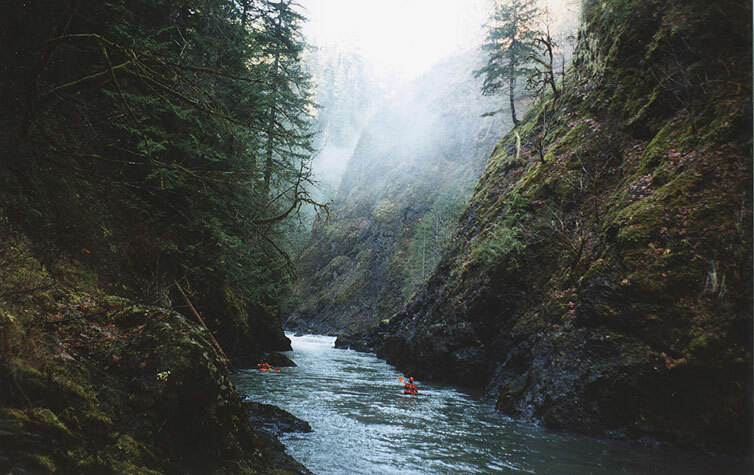 Now we were in the first gorge, and it was impressive, the mossy rock walls soaring hundreds of feet overhead, leaving no way out but down, which seems to be a common theme on the Olympic rivers I have paddled. After a few smaller drops we arrived at a significant horizon line, and got out to scout on the left. What we saw looked good, and Jurgen probed the rapid without problems. Pete went next, flipped in the first drop (a deceptively tricky curler) and everyone got pretty excited but he snapped off a quick roll and ran the bottom two drops without problems. After that Tom and I scouted the lead-in carefully to be sure we didn't repeat Pete's excessively exciting line, and we had no problems. (This drop is referred to as 'Big Momma Jomba' in the Korb guidebook.) I went for the gut in the final drop and did a meltdown move into the pool below, very fun! Jurgen probes the drop known as 'Big Momma Jomba' in the first gorge. Below Big Momma there were a few smaller drops, then the walls peeled back for another mile or so of mellow class II boating. We knew the crux gorge was downstream, so everyone paddled hard to keep the edge on. Soon enough we arrived, and things got exciting in a hurry. The first couple of rapids in the second gorge were relatively easy, and then the walls started to rise out of the water and we ran out of scouting options. Below us the river rushed down between steep rock walls into two huge boulders that blocked most of the flow. There were blind chutes on either side of the boulders, neither of which was scoutable. We could hear an alarmingly loud roar downstream, so we knew there was something big on the other side of the boulders.. The boulder fence guarding the entrance to the crux gorge on the South Fork. There is no way to scout or portage here, or go back upstream for that matter; you just have to go for it! I got out on the left and managed to pull off a sketchy traverse down that side on the horribly slick and sloping rock wall, but I could only see part of the left side chute. Pete eased down to where I was clinging to the wall, and I directed him as best I could. He dropped out of sight, and Jurgen and Tom followed as I skitched and sketched my way back up to my boat. I came through last, and was unpleasantly surprised to find a log wedged in the chute (running paralell to the current) but it didn't hinder my progress into the eddy downstream. Just downstream was a large boulder garden that we ran down the left, then we piled up in an eddy above the next horizon line, which appeared to be a blind, unscoutable ledge. Well, there was only one way to figure this one out, so Tom looked at me and said "I go!" and ran it right down the middle. After a moment he emerged in the pool below looking unconcerned, so we all followed suit..
Pete runs the unscoutable ledge in the second gorge while Tom looks on. Downstream were a few more big drops and then we rounded the corner and saw a steel bridge spanning the gorge two hundred feet overhead. Downstream we could see another group of paddlers scouting a big horizon line, and as we approached they disappeared around a large boulder in the middle of the river, one by one. When we arrived at the drop (known as 'High Steel Falls') I got out to scout and just managed to take a photo of the last member of the group in front of us as he blasted through this beefy double drop..
Thomas O'Keefe surfaces below the first drop on High Steel Falls and gets ready to go deep in the bottom hole. High Steel Falls demands precise boat handling and a cool nerve. You start on the left in a powerful jet of current that powers into the left wall and then drops into a meaty hole. 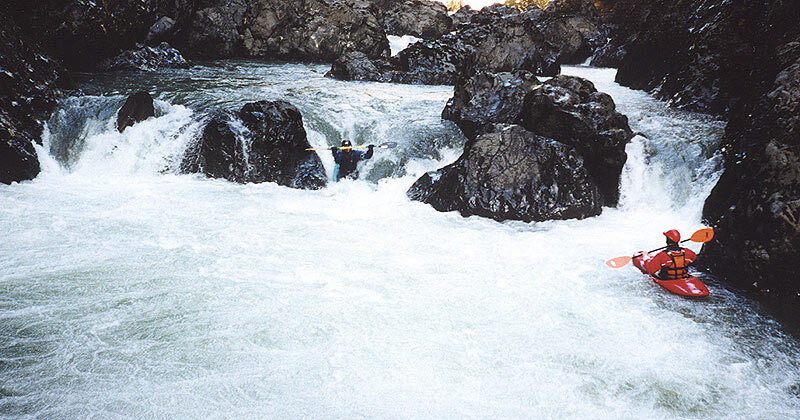 The trick is to blast into a surging eddy in the middle of the river (don't miss! ), then careen down through the double drop on the right. Jurgen blasts through the bottom hole on High Steel Falls. Everyone ran the far right side of this drop. Below High Steel the rapids kept coming, until we arrived at 'Bobbing for Butler', a drop named for a boater who got a savage pounding in the main hole a few years back. BFB is a wild drop that requires a tricky boof ending with a downstream brace in a large hole followed by a wild sprint to the right to avoid the left wall and then..
Jurgen cruises through the first part of 'Bobbing for Butler'. Just below BFB is a nasty-looking V+ drop jammed full of wood and boulders that demanded a river-level portage on the left. Pete and Tom halfway through the not-mandatory-but-highly-recommended portage on the South Fork. Below the portage were more fun drops, culminating in 'Mr. Toad's Wild Ride', a wonderfully entertaining boulder garden that stuff half of us into an eddy on the left and sent the rest careening wildly though the main drop backwards or flailing to stay upright.. great fun! The Korb guidebook recommends that you avoid this section at high water, and I would agree with that assessment. There is no way out of the second gorge once you run the first drop except down the river, and at high water all portaging/scouting/safety options would evaporate and paddlers would be faced with a formidable and unavoidable series of V to V+ drops with horrendous holes (I can only imagine). The photos taken on this site show the river at 800 cfs gradually dropping to 700 on the SF Sko internet gauge. 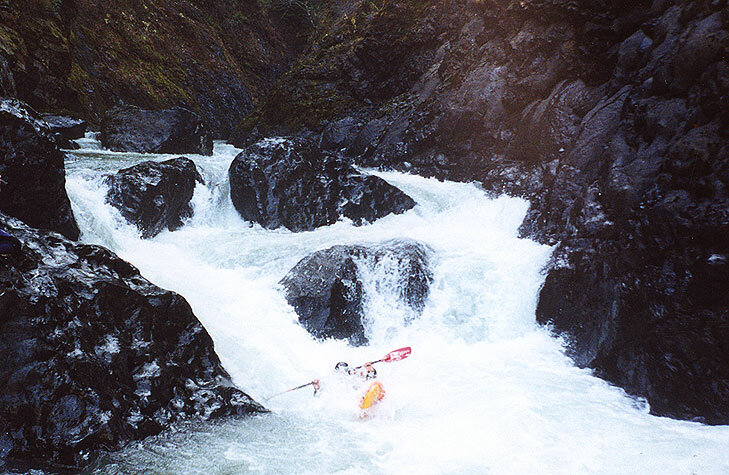 This is a good flow, because the easy stuff at the beginning and end isn't too annoying and the drops in the gorge are pretty manageable. I think 1200 or so would be a nice healthy medium flow, but anything higher would get pretty exciting. Also, I mentioned at the beginning of this report that an excellent paddler almost drowned on this section a few years ago. This near-miss occurred in the rapid below the bridge and above High Steel Falls. Gabe Flock was leading though the drop, and when he turned to look upstream he saw the boater behind him go for the boof but as he reached the lip of the drop his stern got sucked under and his bow shot up as he was sucked under the boulder he meant to boof over! The paddler later told me that came out of his boat as he was sucked under and was forcibly pinned on his back against a boulder in the sieve, with the water coming down with such force that he couldn't move. Luckily the water was surging periodically so he was able to time it so when the flow abated temporarily he twisted and dove down deeper, going with the flow and miraculously squeezing though a slot under the boulder! Almost a minute later he emerged downstream, much to the relief of Gabe and the others, who thought he was gone for good! This drop is the boulder garden immediately above High Steel Falls. It is easy to scout or portage this drop on the right side, so you can make the call when you get there.